“Credit Crunch,” The Practice Of Shrinking TV Show Credits To Run Promos, Was Pioneered By? Although rare was the television viewer who actually read all the credits, once upon a time the credit roll accompanied by a muted theme song was a semi-sacred moment of silence and reflection at the end of a television show. All that changed in the fall of 1994 when NBC began pioneering a marketing strategy known as “NBC 2000” to keep their viewers heavily engaged. Part of this strategy was the marginalization of television show credits. 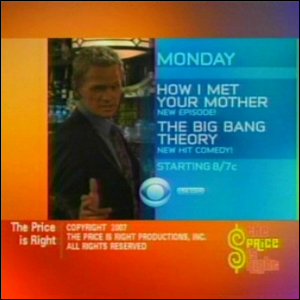 Known as credit crunch, credit pushback, credit squeeze, or any number of terms, the process was all the same: the show credits were reduced down to a picture-in-picture and the majority of the screen was used for promoting upcoming programming so that, without waiting for the credit roll to end, the viewer knew what the next (or next several) shows on the channel would be. Interestingly enough the practice seems to have contributed to the death of credits in general. Many television shows now simply have a vanity plate with the production company’s logo at the end instead of detailed credits and, as a result, credit crunch usage has been in decline since the early 2000s as fewer and fewer shows have full credit rolls to even crunch down. Image courtesy of Kyle C Haight.